Minneapolis Newspaper Signals AG Ellison to Join Bloomberg Scheme? 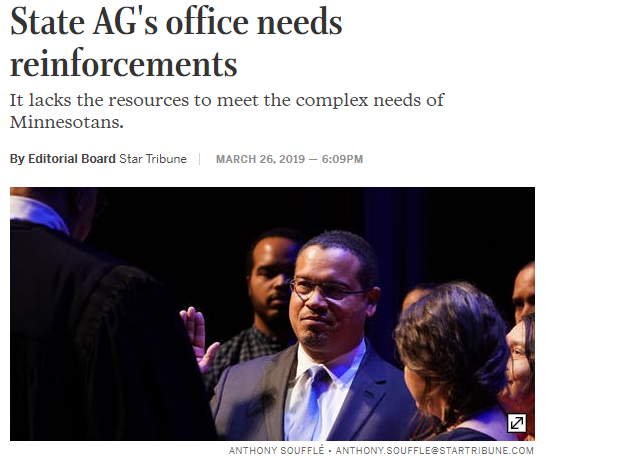 The Minneapolis Star-Tribune’s editorial board notes in an editorial published on March26th, after meeting with the state’s newly elected AG Keith Ellison, that his office needs all the help it can get. We are curious: Did the topic of the Michael Bloomberg scheme to hire and place climate “Special Assistant Attorneys General” come up? The editorial doesn’t say. It is possible, if implausible, the editorial board is unaware of the program rightly detailed by the Wall Street Journal as “State AGs for Rent“. The former DNC co-chair Ellison has a relationship, of course, with party mega-donor and longtime funder of Democratic AG candidates’ races Bloomberg. It seems inconceivable that Bloomberg’s operation hasn’t started down the road of placing one or more SAAGs in Ellison’s Office. The public doesn’t know, because Ellison’s Office has been aggressively stonewalling open records requests on the topic. It could be that this editorial signals to the AG he will get no heat from that paper for joining in. Maybe, it’s just to prepare the public for what the board knows to be coming. Regardless, the silence suggests the press remain incurious about the unprecedented arrangement. After all it’s, you know, climate. There’s just no time, man, to uphold and maintain certain bedrock principles and institutions. If only the NRA or National Right to Life had thought of placing chaired “Special Prosecutors” in AGs offices first. Just to keep our media watchdogs on the job.